Virtual Microscopy as a digital process is an alternative to examining glass slides under the light microscope. The microscopy is “virtual”, because not a light microscope is used any more, but its simulation, as a software. Unlike in telemicroscopy, even on the “objective side” of the process no microscope is needed, as the slides are already existing completely and in maximum resultion digitally. Histological glass slides are digitised with a scanner and stored as virtual slides in an image archive. The scanning resolution is sufficient for presenting all relevant magnifications on the monitor. 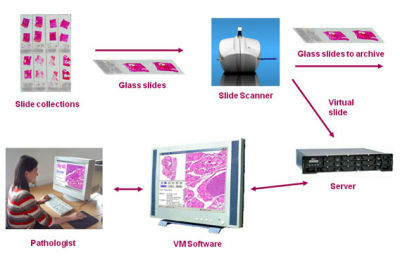 Therefore, virtual slides are very large files whose visualisation requires specialised software: Virtual Microscopes. Those use certain streaming technologies for the presentation without time lags. Please click the links below to view virtual slide sets.